Have you ever noticed the words on the packaging that you shouldn’t bake polymer clay in the microwave? That’s very good advice. You shouldn’t do it! But why? Read on to find out. Will Microwaves Heat Polymer Clay? Microwaves are a form of energy sort of like radio waves and when they pass through food, the waves make the fat, sugar, and oil molecules in food vibrate and dance. And just like a Tuesday evening at a Zumba class, all that dancing creates heat. That heat is actually what cooks your food. Polymer clay doesn’t have much water and no sugar, but does have oil molecules. As microwave energy goes through the polymer clay mass, the molecules start to do their own version of a Zumba routine and begin to get hot. So when you bake polymer clay in the microwave, it heats up and starts to cook. What Happens to Polymer Clay in the Microwave? Because microwaves don’t heat evenly, parts of the mass will begin to cure and harden while others remain soft. Microwave ovens heat the inside of clay just as much as the outside, so as the cooking continues, parts of the mass will begin to superheat, melt, and actually bubble and boil while other parts of the polymer clay mass will merely begin to harden. After a few minutes, the overheated polymer will expand and ooze out. When that super-heated oozey stuff hits the air, it will begin to oxidize (burn), turn black and create smoke. When polymer clay burns, it releases acrid and smelly hydrogen chloride gas, which is nasty to breathe and harms lung tissue. At the same time, because this happens in mere minutes of beginning to bake polymer clay in the microwave, the outside of the clay mass has not yet had enough time for the plastic particles to fuse and create a solid baked polymer clay mass. This means that the clay is crumbly and weak on the outside and melted and horrible in the inside. In addition to the danger from burning, because the melted clay is super hot, you run the risk of burns if you squished a wad of microwaved polymer clay. What About Softening Polymer Clay? Can you use a microwave to soften polymer clay? Yes and no. Just like butter, silly putty, and chocolate chip cookie dough, polymer clay gets softer when it warms up. A microwave can be used to do the same thing, but please know there are limitations. You can’t just nuke a block for a couple of minutes or it will ignite like you see above. Sylvie Peraud suggests that you should make slices and then put them in for 10 seconds at a time. Any more than that and you run the risk of getting hot spots that will ignite. I generally recommend that you warm clay by putting a package in your pocket (or bra) or even sitting on it a while before you use it. Another way is to put the clay into a ziploc bag and immerse in hot tap water for about 10 minutes. Can You Boil Polymer Clay in the Microwave? Some people advocate using a microwave to boil water which contains the polymer clay. The problem with this is that it’s a simple fact of physics that boiling water never heats above 212°F (100°C), (give or take a few degrees based on elevation and water hardness.) Boiling water never comes close to the proper curing temperatures of most brands of polymer clay. While you may find that the item is hard after boiling, it will be incompletely cured and will be weak and easily broken. (This is true for stove-top curing as well.) Some brands of polymer clay will get an icky white residue when boiled as well. The clay itself absorbs microwave energy and can still become superheated, even when submerged in water. I think there’s room for experimentation there, but it’s very difficult to control the amount of heat the items would be receiving. For a quality and reproducable cure, use a calibrated oven. Can a combination microwave/convection oven be used to bake polymer clay? Yes, if you can turn off the microwave part and the oven functions like a regular convection oven, then that is fine and should give excellent results. For more information about properly baking polymer clay, have a look at my series on Baking Polymer Clay. Does Sanding and Buffing Drive You Nuts? 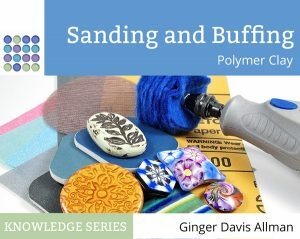 I just published a comprehensive 120 page eBook on Sanding and Buffing Polymer Clay. It’s getting rave reviews and is absolutely packed with information you need to know to make sanding and buffing easier. Come check it out! Good to know that still stands. Every once in a while and more so recently I see a blog post or YT video that does the microwave curing… I even saw where they suggest to warm it up in the microwave! ACK! I never comment on those- because well..maybe there’s a new development. There was a time when the PC community said baking it in your home oven was bad and I now do that with precautionary measures. But I just can’t fathom doing that in the microwave. Some rules are meant to be broken, but that one truly makes me cringe. PS You know I live at Cindy’s and your place, so I added her site below to send traffic. Hope you don’t mind, love you both for all you do for all of us. My microwave oven is a combi and l can use just the convection oven setting – l’ve only used it once but it held a very steady 130° according to my separate thermometer and everything baked perfectly well. I wonder, Ginger, thinking about the incomplete curing in boiling water (in a saucepan or the microwave) if it might be a good temporary method of safely bringing pieces home to be fully cured that we make on holiday, for example. A lot of people do recommend that. I have no tried it, so I don’t know for sure. Really interesting! It’s good to know for amateurs whether or not you can bake clay in a microwave. Thanks for sharing this! Thank you for your researched information. I got a “full visual video” with a polymer volcano erupting. I will choose to forgo my own experiment in the microwave, and try the ziplock in hot water method, as well as using my older clay before the new ( in the future). No more buying clay for me until my stash diminishes, despite me wanting the newest colors. I have been experimenting as I have moved and have no oven. Used one clay K**O and it worked fine used another F**O and it flaked and turned white. Did the water thing, covering it completely, and just went in increments of time and checked as I went along. Maybe of use if you get stuck like me I guess. I have to ask…did you read the article? Neither Kato nor Fimo will be completely cured when boiled because the water cannot read the temperature required to bake polymer clay. Fimo is slightly water soluble when uncured, so it will get a white cast when you boil it. This is why I wrote the article. You cannot properly cure polymer clay in the microwave, nor can you boil it and expect a good result. If you don’t have an oven, there are many options. You can buy a very inexpensive toaster oven, a NuWave oven, a halogen oven, or even an electric roaster. All will work if the temperature inside can reach and maintain the correct temperature listed on the package.